Berwick boss Robbie Horn is hoping Saturday’s game at Elgin gets the go-ahead as his side look to get back to winning ways. After the Wee Gers’ last two matches – against Stirling Albion and Stenhousemuir – fell victim to the weather, Horn is eager for his players to get 90 minutes of action and three points against City. He said: “We’ve managed to train during this period, so we are feeling quite positive about Saturday’s game. 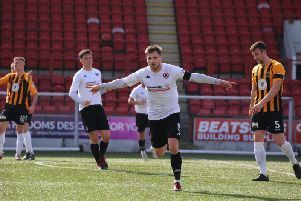 “We had a couple of positive results against Peterhead and Montrose, and even our performance in the late defeat to Clyde in the game previous to that showed signs of improvement. “Elgin is never an easy place to go and they are a good side at home. They still have aspirations of getting to the play-offs, so we know we can expect a tough game. “However, we are more confident now than we were maybe a month or so ago, so it’s a game we are looking forward to. Berwick’s game against Stirling Albion, which was postponed on Saturday, March 3, has been rearranged to be played on Tuesday, March 13 at 7.45pm. The game against Stenhousemuir, which was due to be played on Tuesday, March 6, has been rearranged for Tuesday, April 3 at 7.45pm. This now gives Berwick a run of five home fixtures in the three weeks between March 13 and April 3.